There are a lot of enticing winter squash recipes that call for butternut squash, a smooth-skinned, tan squash, long-necked with a bulb-shaped base. Until this past year, I’d never grown it, substituting instead with winter squash I’d grown to love over the years—dark green Buttercup and Nutty Delica, bright orange Potimarron and Eastern Rise and striped Honeyboat Delicata—whenever a recipe called for butternut. Butternut seemed so dull looking compared to these more colorful relatives. I think I assumed the flavor would be dull too. Still, trying to be more open-minded while ordering seeds last year, I read through the offerings in the “Butternut Group” section of Fedco’s catalog. There was Burpee’s Butterbush described as “chock full of deep reddish-orange flesh ‘as sweet as the best sweet potatoes.’” The texture was “moist but never watery.” “Fruits average no more than 1-1/2 lb.” It was an “excellent keeper.” And it was early, 87 days to maturity compared to 95 days for the Buttercup/Kabocha group and 100 days for Delicatas. In the spirit of experimentation, I ordered a packet. 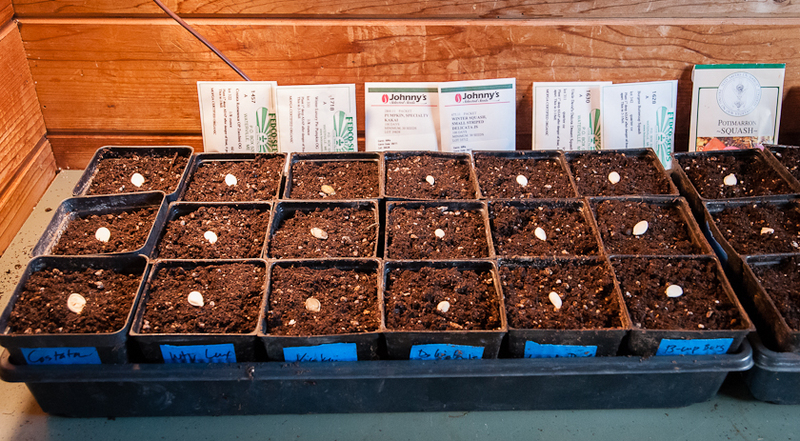 In early May, I started the butternut squash seeds indoors along with the other winter squashes and set out all the plants two weeks later. 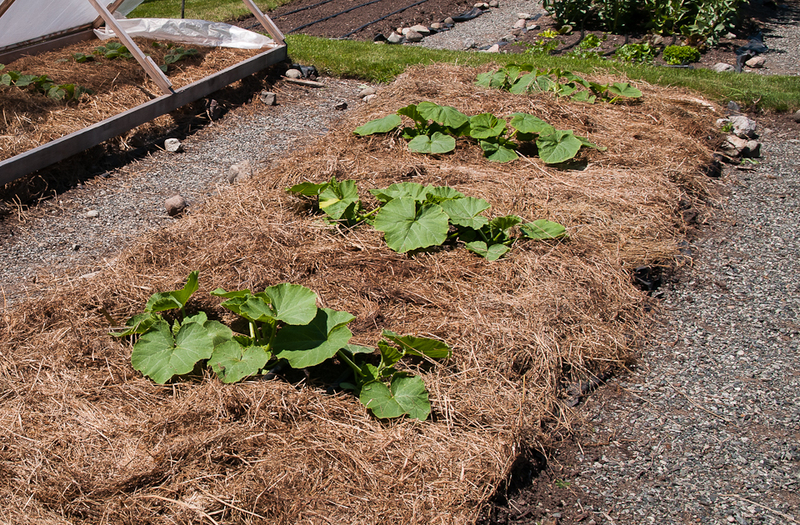 In the first couple of months, the vines of the other squash grew up and over the butternut vines, nearly burying them. The butternut blossoms I could see were slower to set fruit than the other squash and the fruit that eventually set was small and green. I was glad I’d given only one hill to this experiment. By late September though, as the vines died back to reveal ripened squash, a dozen lovely tan butternut squash emerged among the greens and oranges of buttercups and kabochas. I stored them with the rest of the squash and forgot about them. Finally, around Christmas time, curious to try one in a recipe that called for butternut squash, I brought a sample to the kitchen. Sliced in half, the entire neck was solid squash and the seed cavity was small. The flesh was a gorgeous deep orange and smelled wonderfully sweet. With a vegetable peeler, I easily removed the thin tan skin; the thick skin of other squashes requires a large knife. Cutting it into cubes was also easy compared to cutting up other squash. Then twenty minutes after brushing the cubes with oil, sprinkling them with salt and pepper and roasting them at 425 degrees, we tasted this squash I’d ignored for so many years. It was amazing, everything the catalog description said it would be: rich, sweet, creamy and beautifully orange, nothing dull about it. No wonder so many recipes call for it. 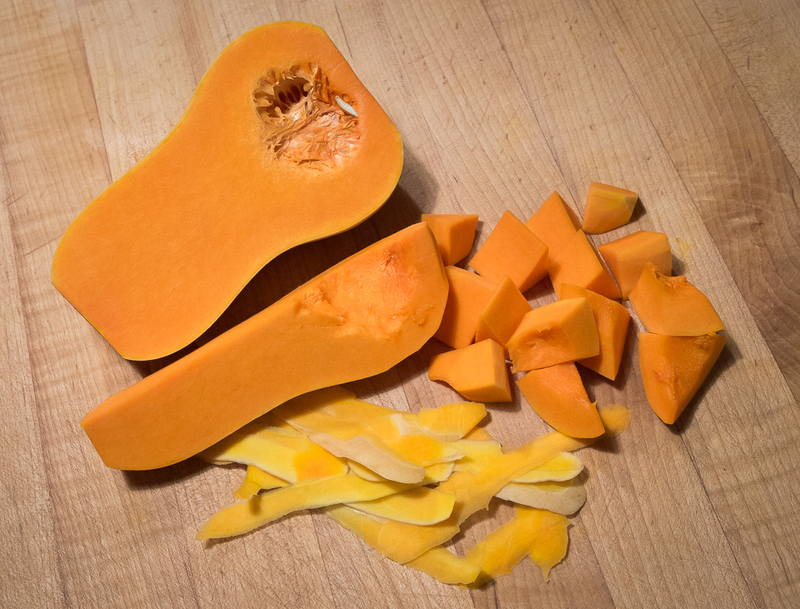 Since this revelation I’ve been going back to recipes that call for butternut squash and making them with this lovely winter squash. 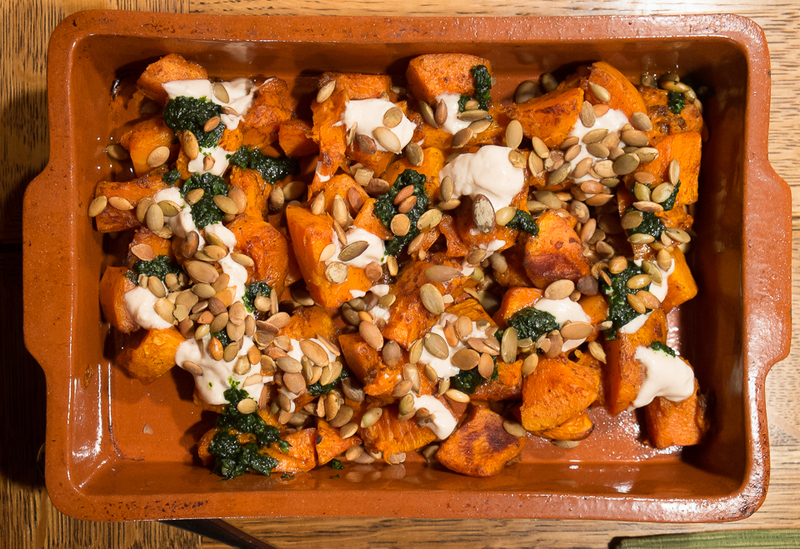 Two current favorites are from Yotam Ottolenghi’s latest cookbook, Plenty More (2014). 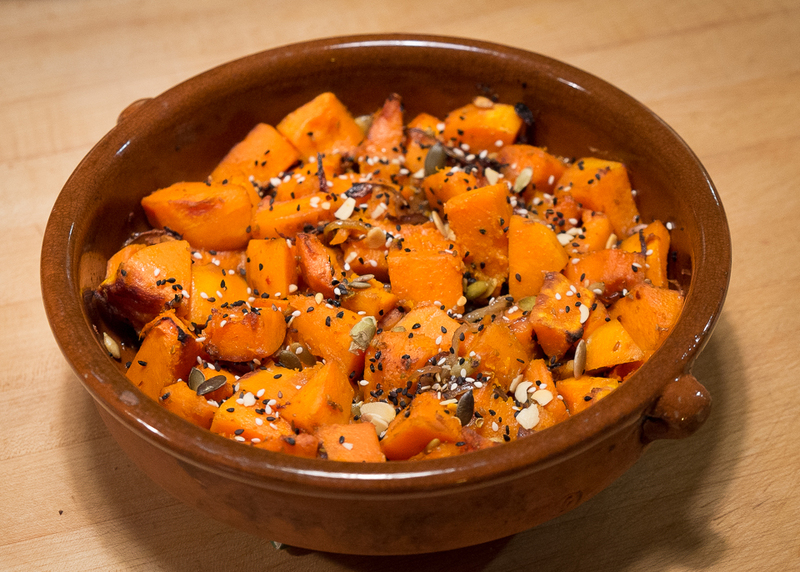 I’ve made his Squash with Cardamom and Nigella Seeds many times using Honeyboat Delicata as well as Potimarron and both are very good, but made with sweet, soft-textured butternut squash it is even better. In addition to the cardamom pods and nigella seeds, ground cumin, coriander and turmeric, a cinnamon stick and a green chile give further complex fragrances and flavors to the rich butternut taste. The recipe calls for sautéing some red onion then adding squash chunks and browning them before adding all the spices, moistening the pan with a little vegetable stock and then baking. It’s delicious warm or at room temperature. A garnish of yogurt and fresh cilantro leaves is lovely too. 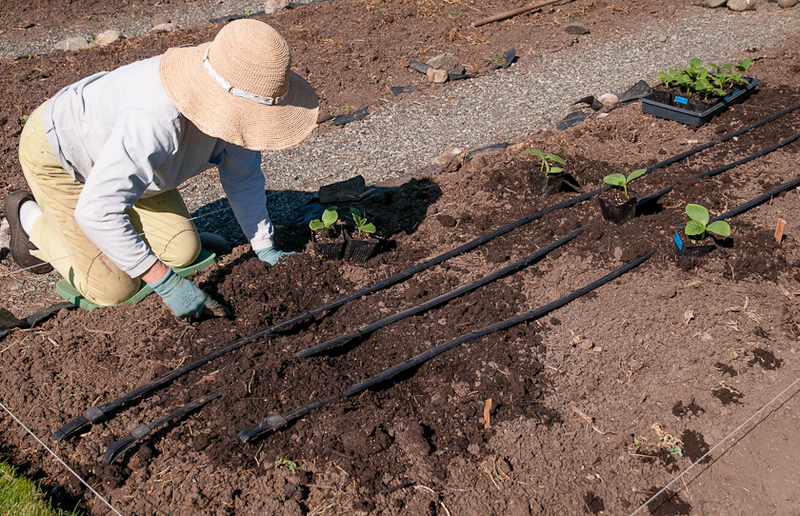 I’m going to plant more hills of Burpee’s Butterbush butternut squash this year and locate them so that other squash vines won’t overrun them. We’ve sadly just finished the last of our small butternut crop but we can look forward to next fall’s much bigger crop. P.S. I noticed that while Fedco carries Burpee’s Butterbush again this year, it’s currently backordered. Burpee’s Seeds carries the original Burpee’s Butterbush, describing it as a Burpee exclusive. Territorial offers Butterbush claiming that its vines are only 3-4 feet long. Fedco cautions that its Burpee’s Butterbush “though named and classed as a bush butternut” has determinate vines which can crawl up to 10′ in good fertility.” Mine crawled at least 6 feet. Territorial also offers Hunter “a classic butternut” that matures faster than any other butternut they’ve trialed. Finally, Johnny’s has a mini-butternut squash called Butterscotch, an AAS winner that they developed. And Adaptive Seeds offers Butternut Early Remix an open pollinated variety they have been developing, selecting for early ripening. 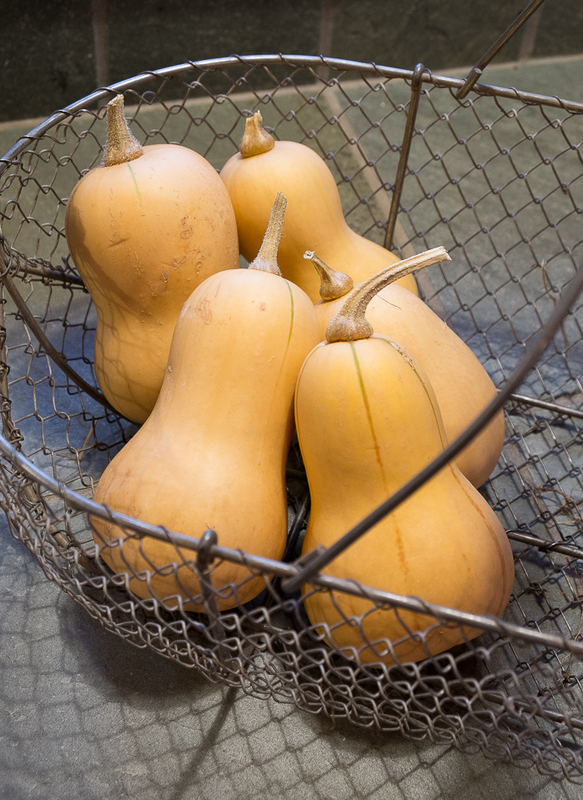 I harvested winter squash on the Fall Equinox this year, a beautiful warm day like so many we’ve had this September. 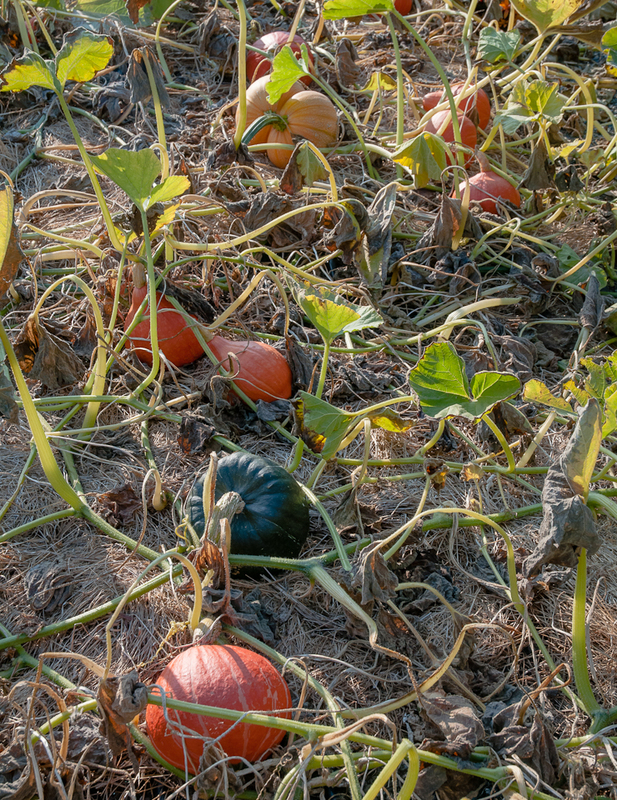 The plants’ big, floppy leaves had begun to mildew and collapse over the past week, revealing the squash that had been growing slowly, swelling and hardening, developing their colors, all summer. They were easy to spot now along the vines that crisscrossed the two beds. Because I was trying some new varieties this year that looked quite a bit like my regular varieties, I followed the vines from each hill, picking all of one variety, piling them into a wheelbarrow and transporting them to the porch before moving on to the next variety. 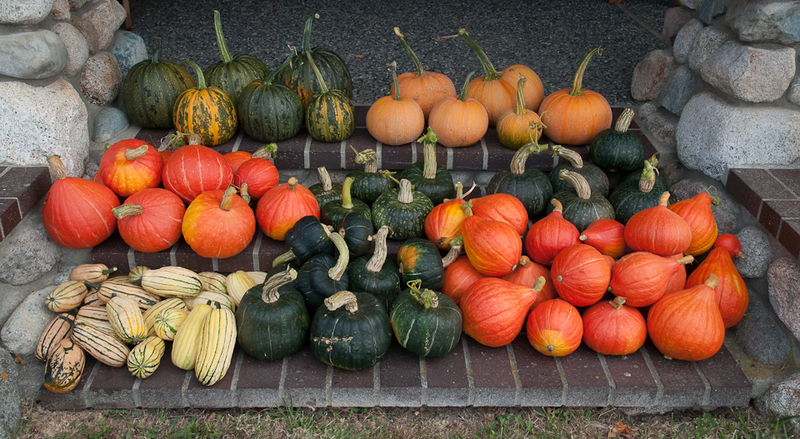 As I lined up each variety on the steps, a portrait of the 2012 squash class began to take shape. Squash are so photogenic and this year’s class was no exception. Starting at the top row, moving left to right, are Kakai, a hull-less seed pumpkin I’m trying for the first time this year with pepitas in mind and Winter Luxury Pie Pumpkin, a creamy, smooth-fleshed pumpkin, just as its name suggests. In the next row down are Eastern Rise, a new orange variety I’m trying this year described in the Fedco catalog as “a superb storage squash that comes into full flavor after December”; Nutty Delica, a Japanese Kabocha also new to me this year and according to Fedco “after storage this one may be the best of all the Japanese Kabochas. Complex flavor of its deep golden flesh improves with age, peaking after January;” and Uncle David’s Dakota Dessert, a buttercup variety I’ve enjoyed for the past several years. Across the bottom are two Delicatas, Honeyboat and Zeppelin, Burgess Buttercup and Potimarron, all old favorites for their flavor and storage qualities. These gorgeous winter squash always seem like a generous fall gift because I’ve put so little effort into growing them. I start the seeds in pots in late April and set them out in the garden two weeks later. In mid-June I mulch them and then they are on their own for the next three months until harvest. They grow and grow, taking over and filling in all the space around them. Regular watering is all they get. 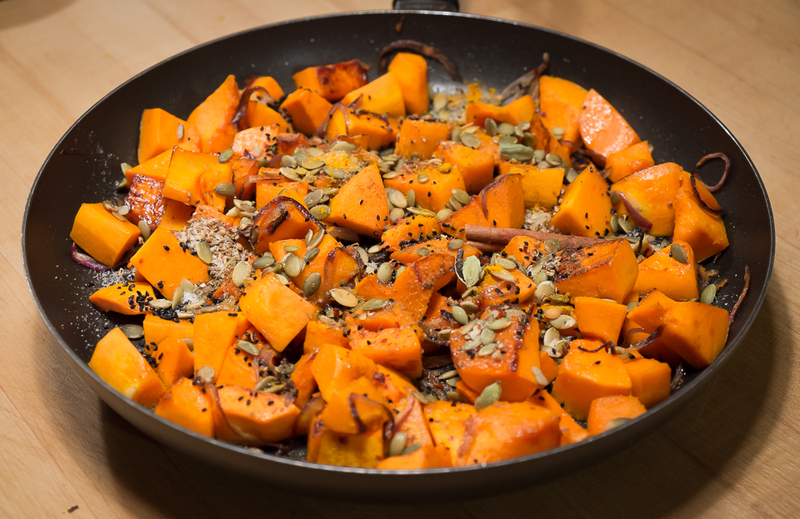 And even after harvest, winter squash make few demands and soon provide delicious meals. I cure them for a couple of weeks in a warm place and then store them in the same cool shed that holds the potatoes. 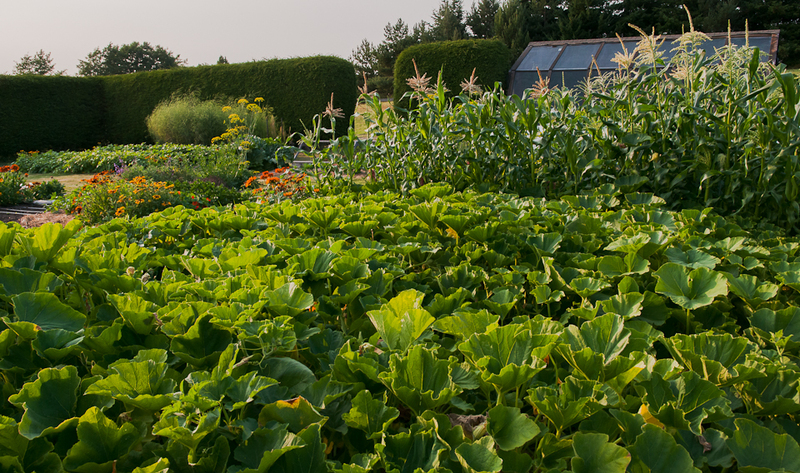 By Thanksgiving, their starches have begun to convert to sugar and some, like Burgess Buttercup and Delicata, are ready to eat while others will be ready in December, January or later. Throughout the winter and into early spring, we enjoy them baked, roasted, mashed, alone or mixed with other vegetables, in tarts and pies, in soups and breads. With their complex, rich sweetness and bright orange color, they are a perfect vegetable to carry us through the winter dark.